"Illusions of Control" is Aerial View's second release and shows a major leap forward for the Sacramento based band. In early 2008, after a year-long search to replace guitarist Steve Wilburn, Aerial View added Jeff Askew to the lineup. Jeff brought a fresh perspective on the band's sound and direction, along with a broad range of guitar tones and sonic textures. To wrap up the self-recorded album (engineered at the band members' home studios), Aerial View brought in industry veteran producer Bob Kilpatrick. “Illusions of Control” was mixed and mastered by Bob at his studio in Fair Oaks. The album features a heavy and atmospheric sound without being overcompressed or overproduced. Bob's goal in completing the album was to “make an honest record”. Mission accomplished! Illusions of Control captures the heart and soul of Aerial View. Hints of the band's musical influences are found on various tracks- listen for the Tool and Collective soul influence on "Condition", Pink Floyd (Hey You) on "Doubt", and Rush on "Kapygna" and "Procrastination". The band consists of Aaron MacMillan, writing most of the songs, singing, playing rhythm acoustic and electric guitar, and keyboards. Rob Santello plays the drums and adds percussion. Radu Filip plays fretless and 5 string bass guitar. and Jeff Askew plays nylon string and electric rhythm and lead guitar. All four band members remain active in the music ministries at their churches and are dedicated to producing and performing music that reflects the life-changing power of God in their lives. The bottom line: Aerial View is a tight, high-energy band that plays music with a positive message. The band's musical style echoes the various influences of the players and is often compared to Rush and other hard rock/progressive bands. "Illusions of Control" Reviewed by RadioIndy.com! 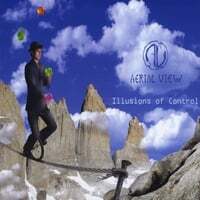 The second released album from the talented group Aerial View is "Illusions of Control." It is an album recorded in the Rock styles of the 80's and early 90's. The song, "All You Need," is a throbbing rock song with scathing guitar solos and dynamic vocals. Another song, "Doubt," has catchy lyrics and vocal patterns that are combined with dancing guitar sounds to make for a toe-tapping rock song. With the track "Kapygna,” they release their aggressive side on this song that almost sounds like the music of Rush as the tight chemistry of the guitar, bass, and drums runs full throttle with a hard rock style fury. This album is one in which a band successfully harks back to that time when rock was between classic rock and the alternative movement. For those who enjoy the music of Rush, Tool, or similar bands, "Illusions of Control" is an album you will want to check out. Powerful, hard edged, atmospheric,and intricate songs with soul searching lyrics mixed with a hint of prog and alternative rock.